I'm thrilled Amy, the brains behind Top Shelf Lacquer, chose me to help her start in this indie world. Her premiere collections consists of neons, pastels, and glitter toppers. 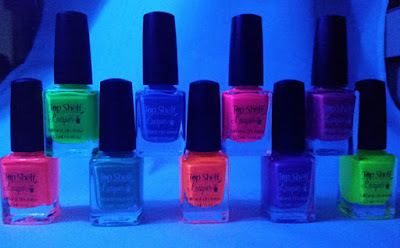 This neon collection consists of 9 beautiful colors that are also UV light reactive. All polishes are made using a 5-free base (No Formaldehyde, No Toluene, No Camphor, No DBP, No Formaldehyde Resin). *Notes: I did NOT use white undies for these pics. 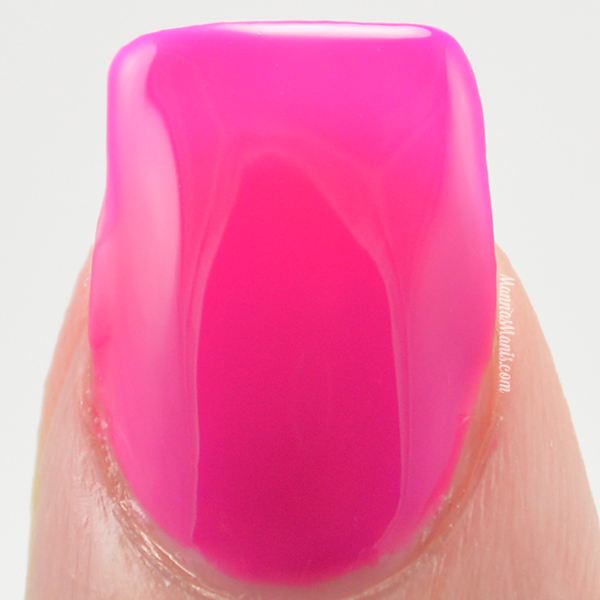 The last pics under each polish are photographed with UV light. Teal-tini is a unique color that you won't find in any other neon collections this year. Amy's color inspiration for this was the green ocean colors of the Gulf of Mexico. 3 coats. Jamaican Me Crazy Red is a super bright and fun color for summer. It's a red, leaning coral creme. It's a little difficult to get a color accurate photo, the first pic was taken with my phone instead of my regular camera. 3 coats. Yellow Flirtini is a super bright yellow creme. Under a UV light, it reminds me of a highlighter. It glows the best under the UV light out of all of these! 3 coats. Purple Dragon Martini is a classic royal purple neon creme. It doesn't react as well under a UV light as the others, so I didn't include a pic. 3 coats. Electric Smurf Martini is a crazy rich blue creme. 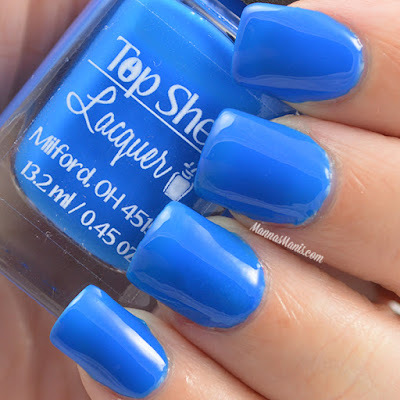 This has quickly went to the top of my favorite blue cremes ever! 3 coats. 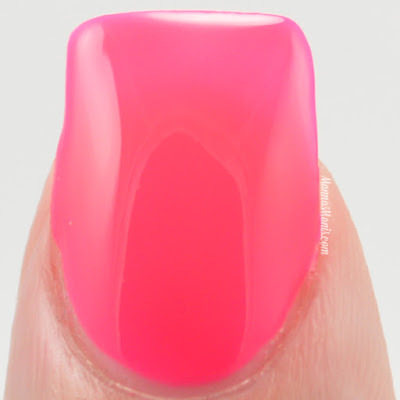 Pink Cosmopolitan is a super bright hot pink creme. This is Amy's pick for her favorite from this collection, and she suggests a white undie to REALLY make it pop. 3 coats. Tropical Orange Dream is a bright orange creme. 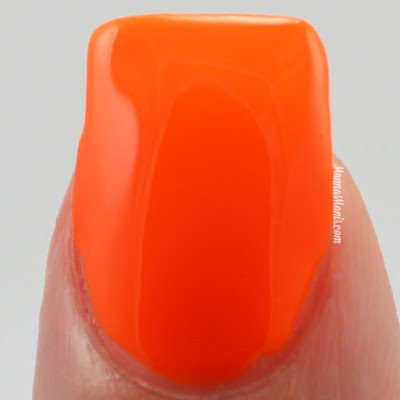 How perfect is this orange? It reminds me of China Glaze's Japanese Koi, except better ;) 3 coats. Appletini is a bright green creme, similar to a green highlighter under UV light! It reminds me of a Granny Smith apple when not under UV light. This is my personal fav from the collection (besides the blue, which well..always wins so it doesn't count) 3 coats. Magenta Joker-tini is another color that you won't find in any other neon collections this year. Pink Cosmopolitan too bright for you? Try this beauty! Doesn't react well under UV light, so no pic. 3 coats. Final thoughts: No issues at all with application. Every formula is like butter and applies like a dream. These are some of the best cremes I've ever used. Amy has put her all into these, and you can tell! 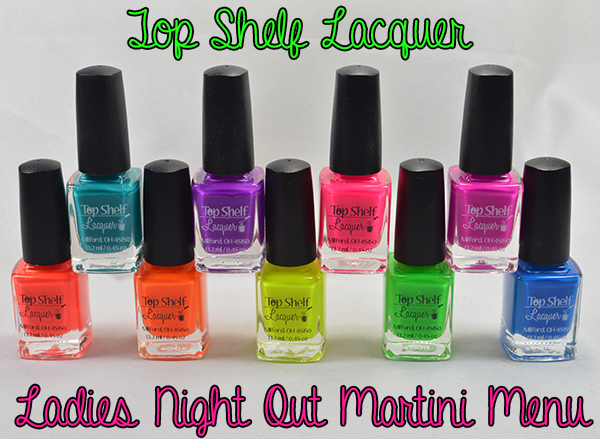 Check back Wednesday for the pastels from Top Shelf Lacquer!